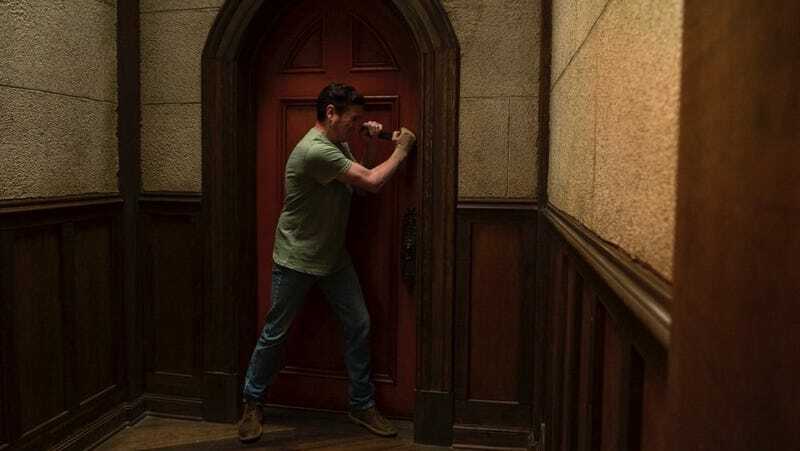 Henry Thomas in Netflix’s upcoming series The Haunting of Hill House. On Friday, Netflix debuts a new series based on The Haunting of Hill House, the third adaptation of Shirley Jackson’s classic horror novel. That’s a lot of Hauntings—on top of certain other, confusingly similar titles like The House on Haunted Hill. Get your ghosts in order with our handy cheat sheet. Julie Harris in the 1963 film. In 1959, over a decade after she first achieved literary fame with the short story “The Lottery,” Shirley Jackson released The Haunting of Hill House. It’s set in a grand house with a tragic history and a spooky reputation, making it the perfect rental for paranormal investigator Dr. John Montague and his two research subjects (an artist named Theodora and a former shut-in named Eleanor, the latter of whom has just lost her sickly mother). Also present: Luke Sanderson, the young man who stands to inherit the place from an elderly relative who’s only tangentially connected to the fearsome Crain family, who originally built the house; and the Dudleys, who act as the property’s caretakers. The Hill House guests face horrors that could be interpreted as either supernatural or psychological (or both), with the sensitive Eleanor feeling the brunt of the property’s mysterious fury. The Haunting of Hill House was the reclusive Jackson’s fifth novel—she’d publish only one more before her death in 1965—and was a finalist for the National Book Award in 1960. It’s still considered highly influential and counts no less than Stephen King among its most ardent fans. The first big-screen adaptation of Jackson’s novel shortened the title, but otherwise stays fairly true to the original story. Directed by Hollywood heavyweight Robert Wise (West Side Story, The Sound of Music, The Day the Earth Stood Still), the black-and-white chiller stars Julie Harris as the repressed Eleanor, Claire Bloom as the glamorous Theodora, Richard Johnson (future star of a very different sort of horror classic, Lucio Fulci’s gorefest Zombi 2) as Dr. John Markway, and Russ Tamblyn (who’d worked with Wise on West Side Story) as the jovial Luke. In an era before many advancements in special effects, Wise relies on camerawork, some impressively-constructed sets, and sound design to build an ominous mood. The actors do a lot of heavy lifting, too—the scene where frenemies “Nell” and “Theo” react to a thunderous pounding that seems to come from every corner of the room is terrifying on every level. Though she’s saddled with a lot of voiceover, Harris is so expressive that the complex emotions Hill House draws out of her character—fear, of course, but also a confusingly deep sense of longing—play out across her face just as much as they do in the script. Lili Taylor in the 1999 film. A few decades later, cinematographer turned director Jan de Bont (Speed, Twister) took a completely opposite approach to the material. His version of The Haunting is excessive both in special effects (with an overuse of CG that, frankly, looked as laughable back in 1999 as it does today) and in the way it embellishes Jackson’s tale. Forget wondering what could be scarier than the horrors lurking in one’s own mind—de Bont’s take amps everything up except the scares, tacking on a backstory that links the Eleanor character (Lili Taylor) to the Crain family. It also pads out the character of sinister patriarch Hugh Crain—who’s long since dead but forever trapped in a painting that comes to life, a device put to far better use in Ghostbusters II. The only vaguely interesting thing about this version of The Haunting, which also stars Liam Neeson (as a doctor researching fear instead of spooks), is that it features early-career turns by Owen Wilson, hilariously miscast as Luke, and a vampy Catherine Zeta-Jones as Theo—the only cast member who seems to realize she’s in a movie that’s taking itself way too seriously. Lulu Wilson as young Shirley Crain in The House on Haunted Hill. We’ll have a full, spoiler-free review of Netflix’s 10-episode series, created by Mike Flanagan (Gerald’s Game, the upcoming Doctor Sleep), to go along with its debut this Friday. But we can report, having already watched the whole thing, that the show takes more liberties with Jackson’s novel than any other adaptation to date—and it does so in a very intriguing way. The cavernous mansion is still the central setting, but the story revolves around a new set of characters, albeit some with familiar names: the Crain family, who move into (and out of) the house in 1992 but are still dealing with many lingering horrors some 26 years later. It’s a dynamic approach that allows for some big emotional arcs, as well as some very effective scares. Let’s just say CG ghouls have come a long way since 1999. Carol Ohmart and Vincent Price in the original House on Haunted Hill. You’re more than forgiven for being confused here, since House on Haunted Hill is basically a word scramble of The Haunting of Hill House. As it happens, the similar-but-not-the-same titles are a coincidence, because the original House on Haunted Hill was in theaters the same year Jackson’s book hit shelves. And beyond the fact that both stories involve a bunch of people trapped in a spooky old mansion, there’s not a lot of plot overlap. House on Haunted Hill is about a slippery rich guy (the legendary Vincent Price) who lures a group of money-hungry strangers to a haunted house for a party, promising to pay them the kingly sum of $10,000 if they agree to stay locked in for the night. Of course, all is not what it seems, and House on Haunted Hill ends up being more of a mystery than a true horror tale—unless you were one of the audiences in 1959 who got to see one of the screenings rigged with a skeleton that flew into the audience at a pivotal moment, one of flamboyant director William Castle’s trademark gimmicks. And here’s another Haunting of Hill House/House on Haunted Hill similarity: The Castle movie also got a remake in 1999. In the newer version, the strangers (including Ali Larter, Taye Diggs, and Chris Kattan) are offered a million bucks to last the night in an old insane asylum. Geoffrey Rush plays the slippery rich guy—and, as in 1999’s The Haunting, there’s an unnecessarily elaborate backstory shoehorned in, as well as some heavy-handed special effects. Not only did Grindhouse deliver two back-to-back features, the cinematic event dreamed up by Robert Rodriguez and Quentin Tarantino also contained a bunch of fake trailers. A few of those faux advertisements actually inspired real movies, but Edgar Wright’s Don’t remains perfect in preview form. And if you’re wondering why it’s on this list of Hauntings and Haunted Hills, that’s because it’s a gleeful parody of gothic screamfests. Truthfully, it leans a little more into 1970s Hammer horror than anything we discuss above, but it’s so fun and over-the-top we couldn’t resist including it. You see that malevolent mansion pictured in silhouette up there? DON’T question it! Next Next post: Want to reduce fraud? Make a better password, dummy!